View the entire table of contents for the Oct. 15 & 31, 2017 issue. On a sunny June day, bistro Le Bilboquet on East 60th Street was packed with smartly dressed men and women of all ages, many tanned from weekends in the Hamptons or other recent travels. Around the corner, elegant women who could grace the pages of Vogue slipped in and out of shops such as Barneys, Bottega Veneta, Moncler and Tod's. There is no mistaking the tony vibe of Manhattan's Upper East Side, but it's far from one-dimensional. Amble west from Le Bilboquet and you'll find eager tourists lingering at the entrance to Central Park. Head north and east of 60th Street and Madison, and the neighborhood changes dramatically. Between 72nd and 86th streets on Second Avenue, the overflowing bars and crowded restaurants are reminiscent of downtown, if less edgy than the Lower East Side. With the opening of the Second Avenue Q subway line at the beginning of the year, the Upper East Side is now easily accessible up to East 96th Street from Brooklyn, Queens and downtown Manhattan. Whether that changes the complexion of the neighborhood remains to be seen. The Q line has already increased residential property values along Second Avenue by 10 percent or more, according to Michael Vargas of Vanderbilt Appraisers. Stretching from about 58th Street to 96th Street and from Fifth Avenue to the East River, the Upper East Side is home to some of Manhattan's wealthiest residents, especially in the blocks from Fifth Avenue to Park Avenue. As you head east, the mansions and townhouses give way to more modest apartments, and the streets and avenues are dotted with new high-rise developments. Restaurants, bars, dry cleaners, cobblers, bodegas, drugstores and other businesses line the avenues. Third Avenue is the dividing line. Most of the nightlife exists along its length and on Second Avenue. Some of the city's best restaurants are on the Upper East Side. It's home to Daniel, which since 1993 has been the flagship of chef Daniel Boulud's empire. He got his start in the same space's kitchen, when it was Sirio Maccioni's Le Cirque. The Upper East Side has come a long way since the 1980s, when Midtown, where businessmen, lawyers and bankers took business lunches and hosted client events, boasted most of the fine dining in the city. "Law offices, medical practices, design companies and small to large corporate entities are still within walking distance, so the business lunches and dinners are still a major part of our dining scene," says Lidia Bastianich, whose restaurant Felidia has been a neighborhood fixture for more than 35 years. "However, real estate is starting to really take off nearby—especially along Second and Third avenues," she adds. "Large luxury condos have been built over the past few years between Third and First avenues, and they continue to dominate the skyline closer to us on Second Avenue." There are also hidden gems like the classic bistro Le Veau d'Or, and Sfoglia, a cozy trattoria. And if you want pizza or a burger, the Upper East Side has those places too. J.G. Melon on my corner has a reputation for great burgers; however, I prefer the version at McKeown's, an Irish bar a few doors up. There are top hotels too. The Carlyle, with its iconic Bemelmans Bar, named after illustrator Ludwig Bemelmans, the Mark Hotel and the Surrey attract visitors and locals for drinks or dinner at the Mark Restaurant by Jean-Georges and the nearby Café Boulud. And overlooking Central Park are the stately Pierre and Sherry-Netherland. In the 19th century, the Upper East Side became a hub for German immigrants, who settled in Yorkville. As the city developed northward, wealthy Manhattanites took advantage of the stretch of land along Fifth Avenue fronting Central Park to build mansions. Rockefellers, Roosevelts, Kennedys and Dukes have all lived on the Upper East Side, along with transplanted Pittsburgh industrialists Andrew Carnegie and Henry Clay Frick. Former mayor Michael Bloomberg never occupied Gracie Mansion when he was in office, preferring his luxurious townhouse on East 79th Street, steps from Central Park. Despite its grand old mansions and townhouses, the Upper East Side is also looked to by those seeking more manageable rents. Once considered a stuffy area whose appeal centered mainly on museum exhibits or visits to Central Park, the neighborhood has shed some pretension as high rents in Brooklyn and downtown Manhattan have driven more and more young professionals northward. In the 27 years that I have lived in Manhattan, I too gradually drifted north, first living in SoHo, then for many years in the Flatiron District, and finally on the Upper East Side, where I have resided for seven years. Each move was prompted by more space for my buck, a challenge that faces most New Yorkers. There are three distinct neighborhoods: Lenox Hill in the south, Carnegie Hill in the north, and Yorkville on the eastern flank bordering the East River. However, my world, like that of most inhabitants of the Upper East Side, is contained within a radius of several blocks, where all the services I need are located. Within a long stretch of Fifth Avenue between 70th and 105th streets, the Upper East Side is home to some of the best museums in Manhattan. Just a block away, Madison Avenue is world-famous for serious shopping, its boutiques selling the latest designs from labels like Anne Fontaine and Valentino. Yet overall, the area is residential, with a mix of ages and ethnicities, families and millennial singles. The opening of neighborhood places like the Penrose and gastropub Jones Wood Foundry give residents a reason to party locally instead of venturing downtown or to Brooklyn. There is a relaxed vibe in the area these days, and we Upper East Siders are just fine if it stays that way. When the Bastianich family sold its two Queens restaurants, Buonavia and Villa Secondo, and moved operations to East 58th Street in Manhattan in 1981, they raised the standard for Italian cuisine. "French restaurants like Lutèce and La Grenouille owned the fine dining scene in Manhattan in the 1980s," Lidia Bastianich recalls. "However, 58th Street had the city's best Italian restaurants, lining the block between Second and Third avenues, with Gian Marino, Tre Scalini, La Giraffa, La Camelia and Vivolo. The Upper East Side, and particularly our block, was a destination place for visitors looking for the best Italian food the city had to offer. Much of that food was more Italian-American during that period." Today, more than 35 years after Felidia opened its doors in Manhattan, the restaurant's menu reflects the diversity of Italy's bounty. Bastianich was the original chef, creating a menu from northern Italy and her native Istrian peninsula on the Adriatic coast. Chef Fortunato Nicotra, who joined Felidia in 1996, has Sicilian roots and Piedmontese training. Those influences were gradually introduced on the menu, and his 20-plus-year tenure in the kitchen has delivered consistency and dishes that play off classic regional influences with creative touches and savvy use of local ingredients. Thin slices of seared strip loin wrapped around beef tartare on a creamy fonduta reminded me of Piedmont, while Tutto Spada, an appetizer special of swordfish, paid homage to Sicily. Paccheri, a large tubular pasta from Campania, was bathed in an intensely flavored tomato sauce speckled with fresh English peas. Felidia's 1,000-plus-selection wine list currently holds a Best of Award of Excellence from Wine Spectator. It's a who's who of top Italian producers, particularly from Piedmont and Tuscany. The Produttori del Barbaresco Barbaresco Rabajà Riserva 2008 ($155) that I ordered handled the beef dish, paccheri and a main course of quail with red cabbage and seasonal vegetables seamlessly. Though not extensive, the selection of wines by the glass covers the peninsula from tip to toe. An Attilio Contorni Vermentino di Gallura Elibaria 2014 ($16) wrapped itself around the richly textured swordfish. The restaurant occupies two floors in a narrow townhouse, and despite the small rooms and dark paneling, it has an elegant feel, brightened up by red leather chairs, strategic lighting and a comfortable noise level. A skylight from the 2016 renovation lends airiness. As development changed the Upper East Side, Felidia evolved with it. "We recently expanded our bar area to welcome both the neighborhood crowd and the young employees looking for a quick bite after work. Our cocktail menu is constantly updated, with both newcomers and regulars enjoying the bar," says Bastianich. In addition to her accomplishments as a chef, Bastianich is a lifelong promoter of Italian food and wine. She is a teacher and a founding partner of Eataly New York, a temple for Italian products. Felidia's staying power is indicative of the allure and consistency of its cuisine, its attentive service and its comfortable ambience. Once the pioneer in high-end Italian dining, it has evolved into a classic. It's fitting that the dishes at Flora Bar are artfully presented, given the restaurant's location on the lower level of the Met Breuer museum, the Metropolitan Museum of Art's new modern-art annex in the former Whitney Museum of American Art building. Sleek and modern, everything about the restaurant's casual space is minimalist, belying the complexity of its food and its serious wine list. Chef Ignacio Mattos and co-owner Thomas Carter, a Blue Hill at Stone Barns alum, are also the partners behind Estela and Café Altro Paradiso downtown. Their first uptown venture offers refined, multiculturally influenced cooking that is subtle, flavorful, layered and exquisite, a compelling counterpoint to the brooding architecture. Mattos' menu is a series of small plates, organized into three sections. Main courses represent the smallest of these sections, but you won't be disappointed or go away hungry if you build a meal around several dishes from the first two categories. I started with a dish of red shrimp, sea urchin and nori, presented in tiny squares, the seafood concealed under sheets of seaweed. It was all umami: savory, briny and lightly crunchy, perfect with Equipo Navazos Fino Jerez La Bota 68 NV ($15 a glass). The mineral, apple and walnut tanginess of the Sherry also served me well with the anchovies and boquerones. I continued in an earthy theme with a rutabaga and raclette tart, whose creamy, crunchy texture played off the earthy and sweet flavors. For that dish and my next course, cod with wild mushrooms in a dashi broth, I needed a wine with body and a certain amount of earthiness. I was thinking Grüner Veltliner, but the closest I found to it on the list was the Valli Unite Timorasso Colli Tortonesi Derthona 2014 ($15). Its apple, nutty and savory flavors and lightly viscous texture worked nicely with both plates. Flora Bar's wine list has more than 300 selections, with 20 by the glass. Half the list is French, followed by Italy and Spain, with several German and Austrian labels among the whites. There is ample choice under $100, but you can also splurge for grand cru Burgundy that will set you back more than $1,000. Wine director Matthew Kudry aims for clean, precise flavors to match the food. "My list is more classic; the downtown list is more funky, with more natural wines," he states. The crowd is a mix of well-heeled neighborhood residents and visitors to the museum. I dropped by in June for a few bites and a glass of wine at the bar. The patio was open and busy, an enclave tucked away from the bustle of Madison Avenue above. Each restaurant's menu has its own distinct personality. "Heavier input on raw seafood marks the difference [at Flora Bar], with cleaner flavor combinations," explains Chef Mattos. "Estela might be bolder and build up flavors, still having the same multicultural influences. Café Altro Paradiso is inspired by the love we have for Italian cuisine, not based on one particular region, while seasonality dictates the menu and always with our own personal take." At Flora Bar, they bring a little downtown feel to the Upper East Side with the menu and wines, without compromising the unique space or the style of the neighborhood. "It's the inspiration to articulate a cuisine that's personal, comforting and unique," says Mattos. The wind and rain had dampened my mood as well as the sidewalk along Third Avenue, but once I began to pore over the wine list and menu at the Simone, the cozy French-inspired restaurant on East 82nd, my spirits warmed. There were some modifications to a few appetizers on the handwritten menu, and co-owner Tina Vaughn offered a few wines by the glass that weren't on the list. I soon discovered that the Simone's intimate scale allows for the kind of attention to detail, flexibility and willingness to please guests that is rare in today's Manhattan dining scene. In this age of social media, the Internet and instant information, the Simone's more personal manner of doing business is refreshing. It was clear that Vaughn knew most of the guests coming through the door. The personal attention continued throughout my meal, from answering questions about dishes to discussing the wines and their affinity with the food to conversing about the benefits of aging Albariño and Muscadet. It seems everything is done thoughtfully and by hand here. Even the website is a work in progress. Vaughn runs the front of the house and chooses the wines; her husband, Chip Smith, is in the kitchen, creating everything on the menu, including the bread and desserts. "He's here from 8:30 a.m.," Vaughn says. The 100 or so wines on the list are almost all European, divided roughly evenly between red and white, with a dozen sparkling wines and Champagnes. There are 10 selections by the glass, but Vaughn suggested several others, saying, "Let me see what I've got tonight." To go with silky sweetbreads accompanied by black trumpet mushrooms, Jerusalem artichokes, salsify and a balsamic vinegar reduction, I had Château Simone Les Grands Carmes de Simone 2014 ($9 a glass), whose elderflower and apple notes reminded of spring, and the Feudo di San Maurizio Petite Arvine Valle d'Aosta 2015 ($9), evoking autumn with its flavors of apple tart and straw. I chose a white and a red to go with the trout special, wrapped in bacon and sitting atop a potato galette. Tips of asparagus and wilted ramps added kick, while brown butter pulled all the elements together. The Domaine Fief aux Dames Muscadet Mounieres-St.-Fiacre 2010 ($9) was complex on its own, suggesting wax, pear, lemon and stone flavors-a terrific match for the trout dish. The Rollin Père & Fils Bourgogne Hautes-Côtes de Beaune 2014 ($9) complemented the trout's earthiness with its bright berry notes. The room is small and softly lit, and as it filled up over the evening, Vaughn apologized at one point. "It's usually not this loud." But I didn't find it overly boisterous. Clearly, everyone was enjoying the moment. The Simone's greatest asset may be getting you to relax and slow the pace of your life, if only for a few hours. Sistina, a cozy neighborhood Italian place for more than 30 years, now has a new space as grand as its cuisine and wine list. In September 2016, owner Giuseppe Bruno moved into the 1902 townhouse on East 81st Street that formerly housed Crown. It's one of many gilded mansions on a stately block between Fifth and Madison avenues. The setting is as elegant inside as out, offering a long, sleek bar upon entry, an airy main dining room brightened by bleached oak walls, and a stunning winter garden with a glass wall, bringing in light by day and doubling as a private party space by night. The list is heavy in Italian reds, especially from Tuscany and Piedmont. I had plenty to choose from among super Tuscans and jewels of Barolo. Giacomo Conterno's Barolo Monfortino Riserva 1958 was listed at $2,800; however, there were many reasonably priced bottles, such as Renato Ratti's Barolo Marcenasco 2004 for $180 and Luigi Pira's Barolo Rionda 2006 for $200. Brunello di Montalcino claims more than 200 spots on the Sistina list, or if you prefer one of Tuscany's Bordeaux blends, there is Sassicaia back to 1982 ($1,600) and Tignanello to 1978 ($1,100). I opted for one of the two dozen wines by the glass, a Friuli Colli Orientali Biancosesto 2015 from La Tunella ($15) for my appetizer of white asparagus with béchamel, morel and black truffle. The extensive selection of wines makes it easy to match with the exquisitely prepared menu, which includes several classic Italian dishes. Sistina sources many of its ingredients from Italy, providing the basis for its long list of daily specials. There was also a nod to local ingredients, with an early spring showing of ramps and fiddleheads to accompany a grilled fish special. My favorite dish was a pasta called Cavatelli Sistina. A veal Bolognese added a creamy touch to the perfectly textured pasta, enriched by the umami taste of wild mushrooms. It begged for one of those older Barolos, but a hint of mushroom in a glass of Volpaia's Chianti Classico Riserva 2012 ($20) worked as well. The service is in tune with the ambience: professional, attentive and relaxed in a manner that comes with a neighborhood clientele, even if the neighborhood is the affluent Upper East Side. I want to return, to soak up some more sunlight in the back room while enjoying that exquisite pasta with some Barolo. Bruno, an avid wine collector and chef, and his brothers also own Caravaggio on the Upper East Side and the Midtown institution San Pietro. All three boast impressive wine lists; Sistina holds a Best of Award of Excellence, and with the addition of Renzo Rapacioli as sommelier, looks to build on its 20,000-bottle wine program of 1,600 selections. Eli Zabar was born on the Upper West Side, one of three heirs to a growing New York City food retail destination called Zabar's. In the 1970s, he left his family business, moving to the Upper East Side. "My brothers are older; they're from a different generation. They had one small store and didn't have the room for me. When I got out of school, I had different ideas, and I had to express my own ideas," says Zabar. Across the park, he has created an empire of food and wine over the past 44 years. "The Upper East Side is my world," he states matter-of-factly. "I live here; I work here. My family lives on the Upper West Side; that's the only reason I go there." Zabar opened his first gourmet food shop, E.A.T., at Madison and 80th Street in 1973. His theory was that New Yorkers never go north, so when all those visitors to the Metropolitan Museum of Art were looking for something to eat, they would walk to Madison, turn south and find his shop. At the time, not much in the way of specialty food shops existed on the Upper East Side. Citarella and Grace's Marketplace hadn't arrived yet, and Agata & Valentina wasn't founded until 1993. Over the years, Eli evolved from sandwich maker to baker, grocer and restaurateur, satisfying his passion for food and wine and offering specialty products for gourmets and enophiles. Taste, Zabar's previous bistro in this space, was redesigned in 2014 as Eli's Table, and Randall Restiano joined as wine director. Today, Zabar's enterprises occupy five major locations on the Upper East Side, between 79th and 91st streets, from Madison to York Avenue. There are four outlets of the upscale take-out deli Eli's Essentials, and there's Eli's Night Shift, a "grab 'n' go" by day, serving coffee, pastry and sandwiches, which converts to a bar at night, featuring wine and cocktails, plus craft beers made exclusively in New York's five boroughs. Zabar's philosophy has served him well over the years. "I like to make things and I like to reuse things," he says. The 20,000-square-foot Eli's Market, founded in 1998, at 80th Street and Third Avenue, is the core operation, along with the commissary and event space located at the Vinegar Factory on East 91st Street. If the farm-grown strawberries or peaches available at Eli's Market begin to lose their freshness, they go into pies, tarts, sauces and even syrups for cocktails, for use in the take-out shops, restaurants and bars. In mid-May, the fresh strawberries at Eli's Market came from a farmer in Big Sur, Calif. Peppery arugula is grown in greenhouses on the rooftops of Zabar's bakeries on 91st Street. The market boasts an extensive cheese section and fresh seafood, and the olive oils are from wineries in Italy. When you can't get fresh tomatoes in season, Zabar grows heirloom varieties in the greenhouses-a perfect example of his resourcefulness. Realizing that the residual heat from the baking ovens was being wasted, Zabar built a greenhouse on the roof, utilizing the heat to grow tomatoes. It took time and a learning curve, but now he grows tomatoes from April through July and September to November. The greenhouses also supply fresh herbs and lettuces for the restaurants. What sets Zabar's enterprises apart from other gourmet food shops and cafés is the focus on multiple locations in the same area. Each spot has its own feel and a slightly different focus, but the top-quality ingredients and Eli's hands-on approach comprise the overriding philosophy. This narrow store next to Eli's Table and above the market stocks a focused collection of European wines, reflecting owner Eli Zabar's personal taste. Since 2014, the 600-selection wineshop (and the list at Eli's Table) have been run by wine director Randall Restiano. The inventory is not only specific to Europe, but to traditional styles and indigenous grapes, with an emphasis on sustainable, organic and biodynamic farming. There is no Bordeaux, no super Tuscans. Zabar's love for Champagne is evident right inside the door. Along with several small growers, there is a selection of Pol Roger, his favorite house. Next comes an eclectic mix from Spain, including several labels from the most recent wine trip to Galicia, and rosé from Domaine de la Citadelle in the Luberon, close to where Zabar has a home. Small, traditional producers are well-represented, like Roagna and G.B. Burlotto from Barolo, Cascina delle Rose from Barbaresco, and Domaine Arlaud and Christophe Buisson from Burgundy. A central table offers featured wines, and there is a $25-and-under section. Eli's Table is the restaurant conjoining the market and Eli's List. With a focus on farm-to-table ingredients, the menu changes daily to match the 20 or so wines by the glass, which also change daily. On a spring Tuesday, you could start with English pea crostini, move on to crispy octopus, celery and parsley salad, and finish up with Maryland soft-shell crabs. Wine director Restiano offers the wines as a 2.5-ounce or 5-ounce pour, or you can order the whole bottle. In addition to sparkling, white, rosé and red, he also listed an "oxidized" Vernaccia from Sardinia and an orange wine from France's Languedoc region. There is a section of aged wines available from the Coravin system, ranging from $13 to $25 for a 2.5-ounce portion, or the options "Conditional Trust," "Pure Trust" and "Blind Trust," where the food and wine choices are made in consultation, or Restiano and his staff choose both the menu and the wine pairings for you. Eli's Table has added wine classes every two weeks, and it is a destination for New York sommeliers and industry people. Though it may find a wider audience, Zabar's goal for both Eli's Table and Eli's List is to cultivate a neighborhood clientele. "We're here to educate," he explains. "We've been [to the wine regions], we know the growers, we've felt the soil. We're doing it right, to be as real as possible." Bootlegger Jack Aaron, reputed to have had one of the best palates for illegal booze, serviced all the high-end speakeasies in New York. It was fitting that after the repeal of Prohibition, Aaron went legit, purchasing Sherry Wine & Spirits Co. at 62nd and Madison in the Louis Sherry building from his drinking companion, Jules Endler, in 1934. In the 83 years since, Sherry-Lehmann has become a bastion of the Upper East Side and one of Manhattan's most prestigious fine-wine retailers. Jack's brother Sam Aaron joined the business around 1935. He and his friend James Beard promoted food and wine together, enhancing Sherry's image as a fine-wine destination. In 1965, Sherry bought M. Lehmann and the company became Sherry-Lehmann. The store occupied three locations around Madison and 62nd until August 2007, when Jack's son Michael Aaron moved it to its present location at 59th Street and Park Avenue. The driving forces behind the business today, current chief executive officer Chris Adams and chief operating officer Shyda Gilmer, are foils to the reserved ambience of the store, seeming more likely to sit down with you over a beer than over first-growth Bordeaux. Yet Adams expertly presides over the buying of Bordeaux and Italian wines, while Gilmer's specialties are Champagne and Burgundy. Their passion for fine wine is the reason Sherry-Lehmann earns revenues of $45 million annually. "We want people to be comfortable buying an $8 bottle or an $800 bottle," says Adams. "We have to walk the walk and buy the wines properly and store them properly at the right temperature. That was the Aaron family's philosophy from the beginning. A store has a personality just like a person." Though it started out selling more spirits than wine, Sherry-Lehmann was always committed to fine wine. A catalog from the 1930s lists Romanée-Conti 1929 for $14 per bottle, $155 a case, and Château Latour 1929 at $3.75 per bottle, $40 a case. Today, about 80 to 85 percent of the company's sales are in wine, 10 to 15 percent in spirits. The store's top-selling category is Champagne and sparkling wine, followed by Bordeaux, California, Burgundy and Italy. Below the sales floor is $1.3 million in inventory, while another $10 million worth rests in a Brooklyn warehouse. Simply put, Sherry-Lehmann has made the Upper East Side the center of fine-wine retail in the United States for decades. Mummies, ancient temples, medieval arms and armor, Jewish history and culture, modern art, design, all things New York and Latin American. That's just a highlight of the art and artifacts packed along upper Fifth Avenue, from 70th Street to 105th Street. This stretch boasts some of the best museums in the world. The southern anchor is the Frick Collection on 70th Street, which displays industrialist Henry Clay Frick's collections of European masterpieces in his Gilded Age mansion. Between here and 105th you can stop by the Metropolitan Museum of Art (the Met); the Museum of the City of New York; and El Museo del Barrio. A number of the buildings are impressive: Additional museums in mansions include the Neue Galerie, which showcases early 20th-century German and Austrian fine and decorative arts, the Jewish Museum and the Cooper Hewitt Smithsonian Design Museum. The real show-stopper though is Solomon R. Guggenheim's ode to modern art, housed in the equally striking building designed by Frank Lloyd Wright. The Met, which includes the Met Breuer, in the former Whitney Museum of American Art space, and the medieval Cloisters way uptown together boasted 6.7 million visitors in 2016. With its $2.5 billion endowment, the Met is the largest art museum in the United States and one of the most important museums in the world. Founded in 1870, the Met offers a diverse array of exhibits, including ancient Egyptian relics, manuscripts, musical instruments and significant European paintings. With the recent gift of 78 Cubist paintings, drawings and sculptures, including 33 Picassos, from Leonard Lauder, the museum also boasts a considerable collection of modern art. Those looking for modern art specifically are more likely to visit the Solomon R. Guggenheim Museum. The Guggenheim Foundation dates from 1937 and includes the Peggy Guggenheim collection in Venice, plus museums in Bilbao and Abu Dhabi. The New York outpost resides in an iconic building that opened its doors in 1959 and is worth a visit all by itself. The permanent collection consists of works by Vasily Kandinsky, Paul Klee and Marc Chagall, among many others. Founded in 1904 with a donation of artifacts from Judge Mayer Sulzberger, the Jewish Museum's 30,000 works of art, ceremonial objects, antiquities, artifacts and media that chronicle 4,000 years of Jewish history make their home in the Felix S. Warburg mansion. Expanded in the 1960s and again in the 1990s, it's also home to the New York Jewish Film Festival. The newest addition to Museum Mile is El Museo del Barrio, founded in 1969 by Raphael Montañez Ortiz. El Museo was created to promote and preserve Latin American culture through art and artifacts. Its permanent collection of 6,500 pieces includes pre-Columbian archaeological finds. The Museum of the City of New York chronicles everything from the history of New York City to cultural adaptation of its residents to social activism. The permanent collection of prints, photographs, paintings, sculpture, costumes and textiles details the story of New York City, while lectures, storytelling and discussions are held throughout the year. The Cooper Hewitt Museum is all about design, past, present and future. It was founded in 1897 by two Hewitt sisters, daughters of industrialist Peter Cooper, and became part of the Smithsonian in 1967. Located in the Carnegie Mansion, Cooper Hewitt is the most interactive of the museums on the Mile. Admission includes a pen that allows you to select objects from exhibits and explore them through interfaces like touchscreen tables. The Process Lab lets you explore design from planning to problem solving. In addition to its collections, the museum offers a master of arts degree course in the history of design and curatorial studies and sponsors the National Design Awards each year. Each year in June, Fifth Avenue closes for the Museum Mile Festival, a block party devoted to these cultural resources. Its popularity extends well beyond the Upper East Side, attracting visitors from around the world. Gay Talese is the best-selling author of 14 books. He worked as a reporter for the New York Times from 1956 until 1965 and is credited with the creation of a literary style known as the New Journalism. He has also written for Esquire, The New Yorker and other publications. Born in Ocean City, N.J., and educated at the University of Alabama, he is a longtime resident of New York's Upper East Side. He spoke with senior editor Bruce Sanderson about his experience in the neighborhood. 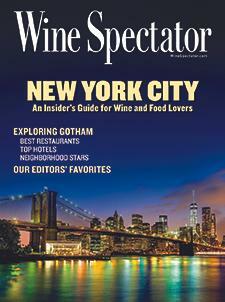 Wine Spectator: How long have you lived on the Upper East Side? Gay Talese: I've lived on the same street in the same house for more than half a century. I'm 85 now and I've been married 58 years; my wife, Nan, and I were married in 1959. When we married, she moved in with me to the apartment and I eventually bought the building. WS: Why did you decide to live there? GT: I learned about the apartment on the third floor front through a gossip columnist who wrote for Cholly Knickerbocker. Igor Cassini, the brother of fashion designer Oleg Cassini, who designed dresses for Jacqueline Kennedy, had two assistants: a young woman from Texas by the name of Liz Smith [later a leading gossip columnist] and Joseph Dever. I rented it for $57 a month in 1957 from Dever. He kept the lease but allowed me to live in it, which I did for a year, paying him directly. In 1959, I took an apartment on the second floor at the front of the building. So we had two apartments, with two separate keys to the front doors. One was our living area and one was for sleeping. Then another space became available on the first floor, vacated by the future Mrs. Otto Preminger. Our daughters were born there in 1964 and 1967. Joseph Dever paid the rent. One day I came home and there was a sheriff's notice on the door for unpaid rent. So I called Dever up and said, What's going on? He said, I'm sorry, I'm sorry. So I paid the back rent owing and that's when I took [the space] over. Eventually, other people moved out, and I bought the building in 1972 on the profits of two books published in 1969 and 1971, The Kingdom and the Power and Honor Thy Father. WS: Do you dine out much in the neighborhood? GT: I dine out every night, at 7:30 p.m. I don't like to eat at home. I never eat lunch and I don't drink during the day. I always start dinner with a gin Martini. WS: What are some of your favorite restaurants? GT: There are four or five restaurants toward Madison that I like. Amaranth, Rotisserie Georgette, and the Regency hotel has a terrific restaurant. I like Le Veau d'Or too, and sometimes I go over to Third Avenue to the Isle of Capri. A new Argentine restaurant opened called Chimichurri Grill, and across the street is a French place called Maison Hugo. It's a wonderful restaurant. Sometimes I go to the Irish place on Lex, Donohue's Steak House, and sit in the back and have a lamb chop. It's a wonderful neighborhood for restaurants. WS: How has the Upper East Side changed over the years? GT: I live on the north side of the street. When I look out my window, what I see now and what I saw then is unchanged. It's amazing. Around the corner on Lexington is the same hardware store, the same barber. It's certainly no discomfort that there is stability around you. The buildings have not been torn down. They have survived, and it's become part of my consciousness. If I walk two blocks, there's a construction site. Of course, there is scaffolding everywhere. Scaffolding is a part of the ongoing facelift in New York. But my dry cleaner, my shoe repair, my barber, everything is right here. My barber had a fire in the shop, so my favorite barber there, a lady from Scotland named Mary Goldie, comes to my house every two weeks to cut my hair. My tailor, Sal Cristiano, is on the southwest corner of Lexington at 61st Street. I've maintained my weight over the years, so I'm able to wear the same suits, but sometimes they need altering or restyling. He does great work. All these things make living in a big city reduced to the scale of a small village, or small town.